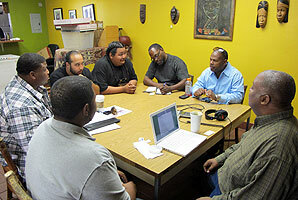 Community organizers meet at the World Ground Cafe to make plans for "Save-a-Life-Saturday" a one-day cease fire throughout the city of Oakland on August 11th. Earlier this month, seven Oakland residents were killed in seven days. That led city council member Rebecca Kaplan to introduce a resolution establishing gun violence reduction as the city’s top public safety priority. It’s largely symbolic. For many Oaklanders, stemming violence has long been their number-one demand. Andrew Stelzer reports that rather than just look to officials for answers, a group of street-level community organizers has an idea that starts with just one day.